Anyone who has read this blog for awhile knows what a huge fan I am of Armani Luminous Silk Foundation. 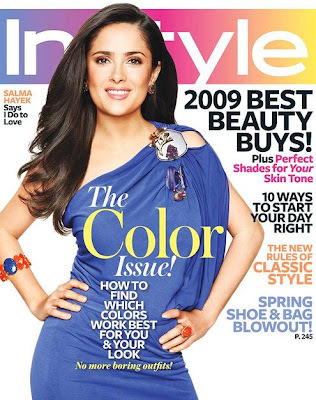 In fact, a lot of people know now since I've been quoted about it in the new issue of In Style magazine. They quote me as saying it's "as good as airbrush", but really, I think it's better! 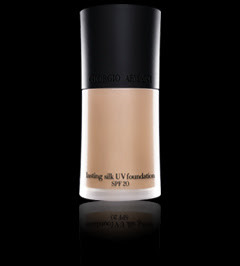 Well, I didn't think it was possible, but Armani has managed to improve upon the greatest foundation around! Their new formula is called Lasting Silk UV Foundation, and it's the.best.EVER! I tried the new foundation yesterday and was blown away! It glides on the skin just as beautifully as it's big sister, Luminous Silk, with the same (if not better) buildable and weightless colour. This formula is a semi-mat so it's not quite as dewey. Hard to believe, but it is also longer lasting! It has the same beautiful luminosity as it's predecessor, but I am loving the new texture! And, to top it all off, it has SPF 20 to protect your beautiful skin from the damaging effects of sun! Amazing! Available in Europe in September, and I'm not sure when it will be available in the US, but I am looking in to it for you and I will keep you updated as soon as I have an answer! Update: Armani tells me it will be available in the US on April 1st! Yay! You should! It's available April 1st. How do you feel about the primer? I am very tempted to try it as well.